Here’s Day 2 of The Pentecost Novena! Praying for a dear friend who is on life support. For my family, siblings, relatives, and friends to return to their Catholic faith. For my uncle and his wife to recover from cancer as well as our pastor and a friend’s daughter. Please help me in my weakness and help me to help my husband as he ages. Bless all my family and help Geraldine in her family struggles. In the name of the father.Amen. Please pray for my brother that he be restored to full health, and that he and his family continue to stay strong during this difficult time. Please help us all to remember how important it is to continue praying for his healing. Thank you. Holy Spirit, I pray for you to enlighten my son Paul, as he takes his 3rd and 4th CPA exams, this month and next month. He has worked hard and needs to gain his confidence. For guidance to find the correct doctor and treatment for my chronic illness. For my faith to strenghten. For our church members to become more active in helping to keep our parish viable. For my son to find a job to match his skills. Mostly, I thank my God for the many blessings already received. I pray that the Holy Spirit, the Almighty will send forth complete healing to me and grant me a prosperous life all of my days to come. Amen. I also pray for peace and love to fill the earth and all the hearts of man. Amen. For my family, and my father in particular to return to the church before he dies. For my daughter to go forward haxe strengths and confidence. For my son to go forward and also have confidence in himself.. I ask thid through christ our lord. Praying the the awesome shining power of the Holy Spirit shine I. The lives of my family members that have turned or are turning awake from their faith. And that that same Light may shine on my life to lead me to holiness. Glory and Honor to the Gifts of the Holy Spirit. 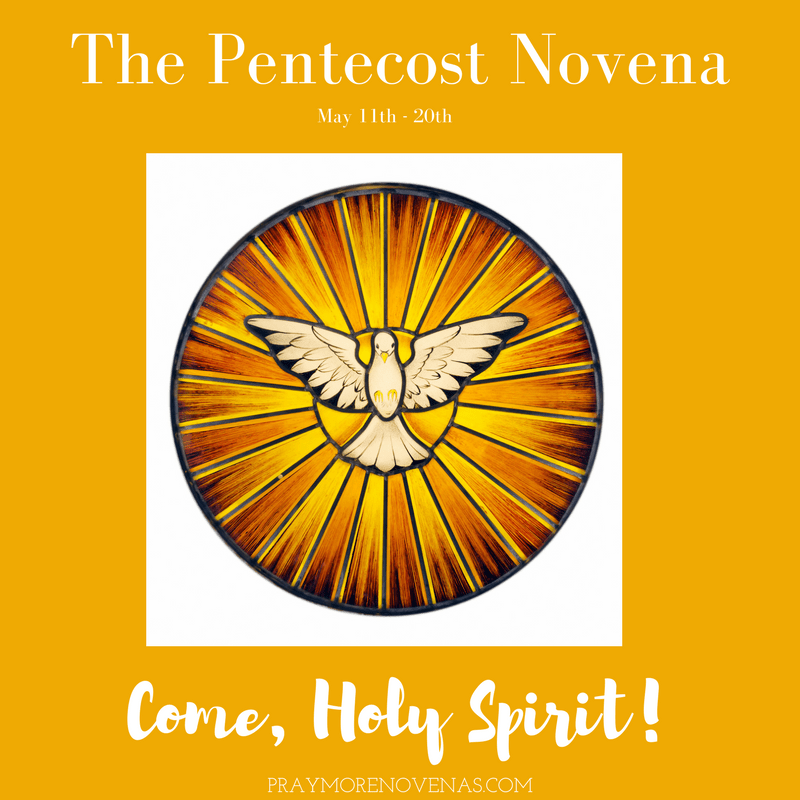 My concrete prayer request for this special Pentecost Novena is that God would meet my financial need and exceed my blessing beyond my dreams. As he said in Ephesians 3, He is able to do all that we think or ask, exceedingly abundantly above all that we think or ask. That is my request so that I will not need to live in constant anxiety stressing over Financial burdens. Lord Jesus I’m still continue praying to be the topnochers of nurse licensure examination on June 3and4 with the average of 88%..Lord Jesus give me more knowledge and retentive memory while I’m studying..Send me angel to guide me and watch me to have focused and have concentration…I love you Lord Jesus Amen ..
Lord Jesus. I pray that the holy spirit would send the sprit of joy up in my life and the life if my children, my husband and my family. I pray for money to finance all my son’s needs and my personal needs. I pray for money to finance my son throughout medical school. I pray dear holy spirit that my daughter would be successful with her exams. Please pray for my nephew LD and CA to return to the Catholic Church. Come Holy Spirit and shine over LD and CA as they finish up their wedding plans for a more than perfect wedding with everyone being safe healthy and happy; to start a holy and strong marriage. I pray for my 104 year neighbor, G, that her family will treat her with love, respect and dignity. Pray for me that I may be filled with the Holy Spirit. Come Holy Spirit. Please teach me to be patient and kind. My wife is suffering and has shut me and others out. Please heal her anger and bitterness, and fully restore our marriage and family. Amen.